Let it be known that this book is as intriguing as the cover! And coming from a #coverho, that's pretty good stuff. 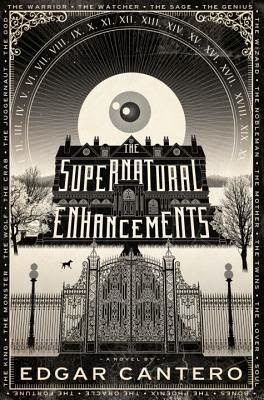 Where should I start with The Supernatural Enhancements, by Edgar Cantero? In a book this twisted, you just have to jump in. An unnamed young man named A. and his sidekick, the 17-year-old mute, Niamh, move to Point Bless, Virginia where A. has inherited his second-cousin-twice-removed's eery old mansion. Not long after their arrival strange happenings-- ghostly visitors, flickering lights, overwhelmingly realistic dreams, and cryptic messages--begin to consume their days...and nights. This story is told in snippets: letters, notes, video and audio transcripts. I'm usually not one for this type of format since it can get a little gimmicky, but Cantero has done an admirable job of maintaining a distinctive "voice" for the characters and a nice mixed atmosphere of doom and shenanigans. While I've seen this one compared to Night Film, by Marisha Pessl, I get the feeling this book takes itself less seriously. What we really have here is an adventure story. The characters don't have to go very far to find the adventure...it's inside their own crumbling mansion...but it's no less adventuresome. The tone of this novel is no doubt ominous, but it's lightened up by the often flippant, snarky characters. At times it has touches of the Victorian in a decidedly contemporary setting. Bits of the novel are surprisingly thinky, as the characters find themselves going down the rabbit hole of cryptography and various puzzles. It sure kept me guessing with its complexity in those moments, and it added to the sense of twisted mystery. It's all a really odd, but amusing mix, and I was rapt until the last page. And OHHHH, the last page. When I finished this book, I went to Twitter with an, "I need to talk about this!" Tweet on my fingertips. This would be a great choice for the RIP event later in the year or a feisty way to cap off summer. Source: Received from the publisher in exchange for review consideration. I was a little unsure about this one, but I think between you and Rory I've been sufficiently won over. I think I'll save it for a good Fall read, but it's definitely going on the list! Definitely an excellent fall choice. Just the right amount of creepy and fun! I do like narratives told that way so I'll have to look for this. From the cover I thought it might be too creepy for me, but it sounds like it's not. Definitely not. There's a small creep factor, but it's more mind-bendy and snarky fun. It doesn't sound too scary! So a whimp like me should enjoy it, right? Love the cover! Not at all! Just enough creepy to create a great atmosphere. I love the sound of this book! I'm adding it to my TBR list and thinking it would be perfect for RIP - thanks!! Definitely a great RIP choice! I hope you enjoy it, Nadia! I am so excited to start this! Yay that it is as good as the cover is awesome! In fact, I might start it today. Sounds like an awesome read! I've just put in my request at the library! Excellent! I hope you get a copy quick! I never would have picked this up because even though I love a good crumbling mansion this type of book is normally done badly. It sounds like this was done really well so I'm putting it on my wishlist. Thanks for sharing! This sounds fabulously clever and weird! I'm adding it to my list. "Doom and shenanigans"?? Hee!! Love that phrase. Also, I think I must read this book. I got kind of a "Night Circus" vibe from the cover - are there any similarities? BTW, for the reminder about RIP. I feel cozier already just thinking about it! I want to read this! Right now! So good! I love the ending too. It's the perfect blend of spooky and weird. I love a good mindf@ck! Andi, I hope you enjoy Major Pettigrew as much as I did...vey endearing story. High school bookshelf appropriate? The format sounds like it would catch their attention. Thanks for the review. Adding it to my list! This one looks so good, both the cover and the story within! Just added it to my TBR!! This one is on its way to me RIGHT NOW from my library and I plan on it being the first thing I read for RIP! I only read the first line of this review because I didn't want to be spoiled for anything, but YAYYYY. I'm so glad the insides match the outside. I want to read this one - real bad. This sounds so interesting! I love books in this or other untraditional formats and books with thinly puzzles.